Predecessors specify the relationships between project tasks and indicate when a task should begin or end in relation to other tasks. The first step would be for you to create your project plan which includes project tasks, milestones, and duration. Once you have an outline, you can start defining predecessors. Finish-to-Start predecessors are the most commonly used type of dependency. When a Finish-to-Start predecessor is used to connect two tasks, this means that Task B cannot start before Task A is finished. The image below shows an example of a Finish-to-Start type of predecessor. When a Start-to-Start predecessor is used to connect two tasks, this means that both tasks start at the same time. However, these tasks can finish at different points in time. The image below shows an example of a Start-to-Start type of predecessor. When a Finish-to-Finish predecessor is used to connect two tasks, this means that both tasks finish at the same time. However, these tasks can begin at different points in time. The image below shows an example of a Finish-to-Finish type of predecessor. Start-to-Finish relationships are the least commonly used in project planning. When a Start-to-Finish predecessor is used to connect two tasks, this means that Task A cannot finish until Task B starts. The image below shows an example of a Start-to-Finish type of predecessor. The image below shows an example of a Start-to-Finish type of predecessor. Now that you understand the different types of predecessors, you are ready to define the dependencies that exist between your project tasks. This is done simply by entering a value in the empty cell for each project task under the Predecessors column. 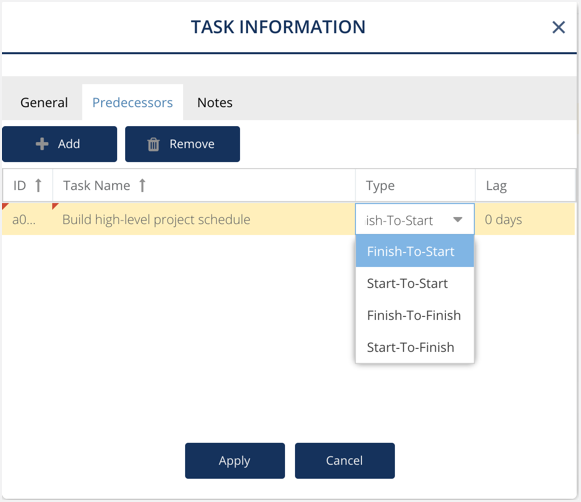 To define a Finish-to-Start type of predecessor, simply double click on the empty cell for the project task under the Predecessors column and enter the row number of the previous task it relates to. 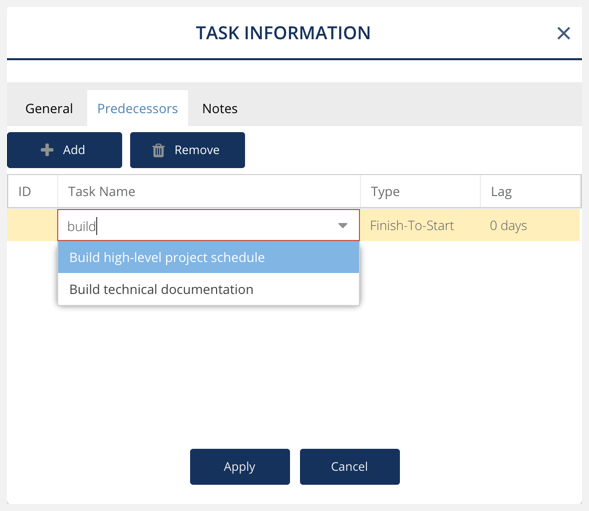 The Gantt Chart will automatically connect the two tasks together based on the predecessor you specified. To define a Start-to-Start type of predecessor, simply double click on the empty cell for the project task under the Predecessors column and enter the row number of the previous task it relates to with "SS" (see example below). To define a Finish-to-Finish type of predecessor, simply double click on the empty cell for the project task under the Predecessors column and enter the row number of the previous task it relates to with "FF" (see example below). 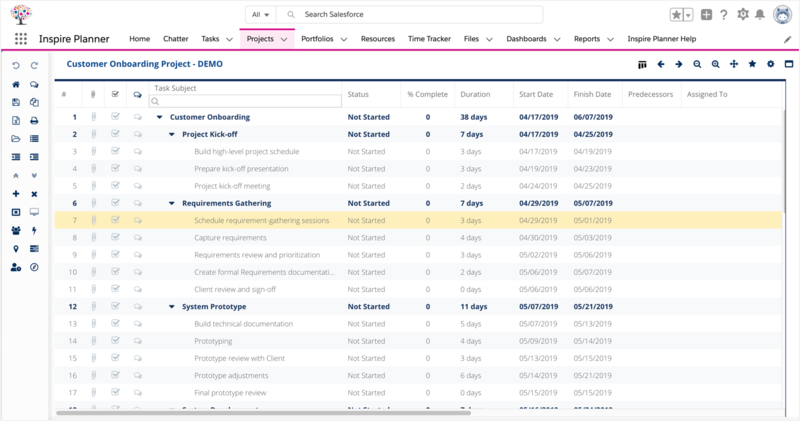 To define a Start-to-Finish type of predecessor, simply double click on the empty cell for the project task under the Predecessors column and enter the row number of the previous task it relates to with "SF" (see example below). If a task has more than one predecessor, you simply enter each predecessor separated by a semi-colon. In the example below, Task 10 is dependent on the three tasks preceding it (Task 7, 8, and 9). 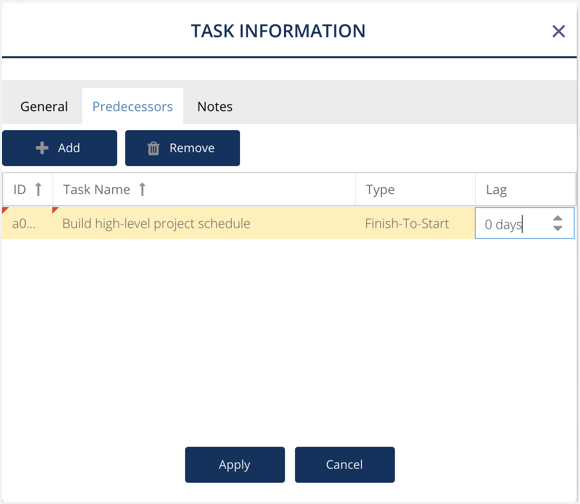 The Gantt Chart will automatically connect the tasks according to the predecessors you specified. This is done by double clicking on the empty cell for a project task under the Predecessors column and clicking on the Edit icon. 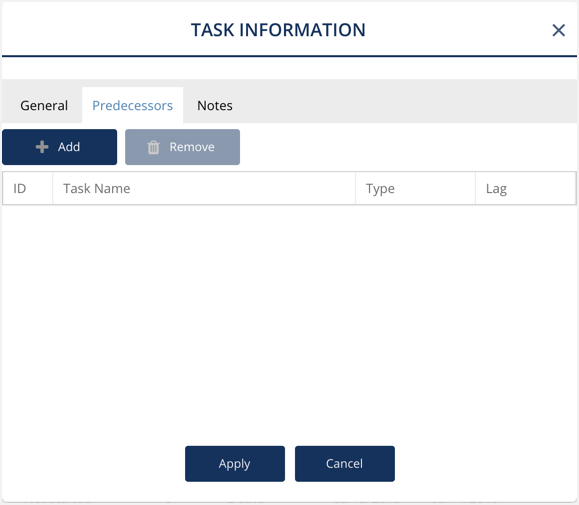 This will open the Task Information window with the Predecessors Tab open by default. Click on the Add button. Thenfrom the Task Name dropdown, select the task (Task A) you want this task (Task B) to be linked to. In the example below, if we wanted to create a dependency between the task "Prepare kick-off presentation" (Task B) and "Build high-level project schedule" (Task A), then we would click on the Edit icon beside "Prepare kick-off presentation"
Then from the Task Information window, click on Add and select "Build high-level project schedule" from the Task Name dropdown. You can also enter the task name to search for it in the dropdown. Next, select the type of predecessor from the dropdown list. If there is a lag between the tasks, you can enter the Lag time in days. Click on Apply when finished. You'll notice that the Predecessor column now contains a value. The Gantt Chart has also updated to display the dependency between the two tasks. Predecessors can also be defined within the Gantt Chart by drawing a line between tasks. For more information on how, see Managing Predecessors in the Gantt Chart. For first-time project planners, please see Getting Started with Inspire Planner,or log a Help Ticket and someone from our Inspire Support Team will get back to you.